How Many Technologies Do You Have to Use to Get the Most out of Research Results? This is the eternal question, for marketers, neuromarketers and new generation researchers. The thing is that there is no exact figure, everything depends on the situation or the product, and, of course, such trivial things as budget. You just can’t get around it. The good news is that contemporary DIY research platforms enable a qualitative research involving as many technologies as you want. Another side of the coin, though, is that you have to find the most appropriate solutions in this abundance of techs yourself. It can be really challenging as the most effective combinations differ in each particular case depending on such parameters as the subject of the test, audience, purpose, etc. Nevertheless, based on our experience, we came up with a list of the most appropriate neuromarketing tech combinations. ● Facial coding (emotion measurement) – tracks the movement of facial muscles, which in turn display emotions. It helps researchers to understand whether customers say what they really feel. ● Eye tracking – tracks the movement of the gaze of respondents. It helps to identify elements of the demonstrated objects which attract the attention of customers the most, register the duration they concentrated their sight on it, how quickly they shifted their sight from one area of interest to another, etc. ● Electroencephalogram (EEG) – measures the activity of brain waves in order to identify to which extent the person is concentrated, relaxed, irritated, puzzled, etc. at the particular moment of interaction with the product or promotion content/materials. ● Galvanic Skin Response (GSR) – measures the emotional stimulation related to satisfaction, discomfort and anxiety. It demonstrates reactions of the brain to these external stimuli by analyzing the skin response. ● Electrocardiography (ECG) – tracks the heart reactions to external stimuli. The heart rate data can serve as an effective tool for the crosscheck of information received through EEG and GSR. Implicit tests stand alone in this list because they are designed not just for measuring some reactions but for getting deep insights that help to understand whether people have hidden preferences and attitudes. Usually, implicit tests are conducted separately from other types of neuromarketing tests. How to better combine these tools? If you test video materials, then emotion measurement, eye-tracking, and EEG are the most effective combination. All three tools will provide you with high-quality data on respondents’ behavior and will help to identify gaps in the tested product. 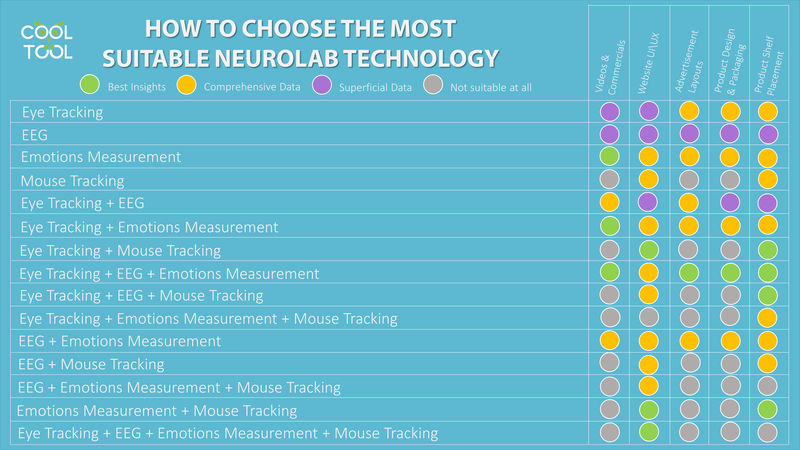 For the testing of user interfaces, it’s better to use the following combinations of neuromarketing tools: eye tracking + mouse tracking; emotion measurement + mouse tracking as well as all 3 tools in combination with EEG. Such a wide range of tools is explained by the complexity of user’s interaction with the interface as it involves a lot of actions which should be simultaneously tracked in order to receive the most accurate research results. Mixing emotion measurement, eye tracking, and EEG is the best solution for obtaining in-depth insights when testing advertising. Though, if you are on a tight budget, using any two of these tools which still provide you with comprehensive data and decent results. Taking into account that such tests are profoundly reliant on the analysis of visual information, the combination of eye tracking, EEG and emotion measurement would be perfect here as well. At the same time, your data dredging will be still fruitful even if you use just the combination of eye-tracking and emotion measurement. Such tests can be effectively conducted using the widest range of neuromarketing tools’ combinations: eye tracking + mouse tracking; eye-tracking + EEG + emotion measurement; eye tracking + EEG + mouse tracking; emotion measurement + mouse tracking – all of them will provide you with comprehensive data on your respondents’ true feelings, desires, and intentions. The above-mentioned combinations are based on our experience. Through our own studies, we proved that these combinations are able to provide great thoughtful insights, but who knows how many different ways to use these tools exist. That’s why we encourage you to share your own cases (both successful and not) of neuromarketing techs combination which might help others in the community to improve the quality of their research. 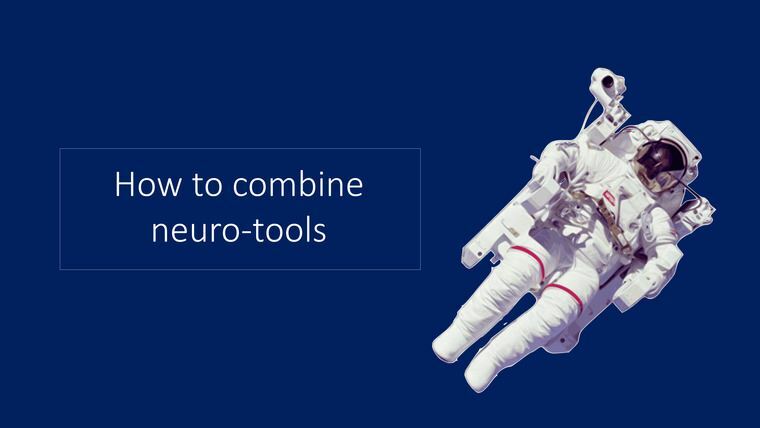 Here you can also check other combinations of neuromarketing tools.